Air Quality Test – The first step to properly removing mold is to get an air quality professional (Industrial Hygienist) to test the affected areas. With the test results the air quality professional will be capable of writing up a protocol on how to remove the mold in your home. 3. 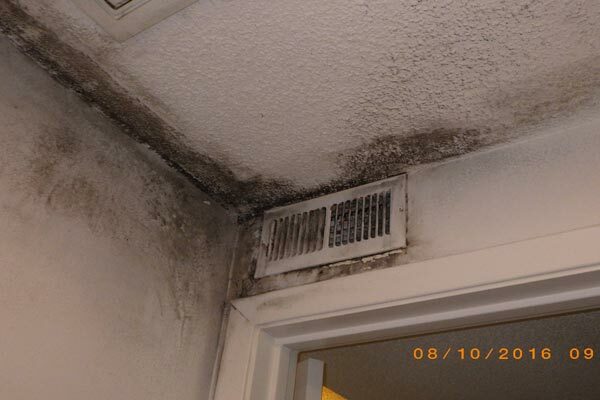 Mold Removal – Once containment is set up and the moisture source has been properly taken care of, we can begin removal. This procedure will depend on the protocol written by the air quality professional after testing. This may include removal of drywall, carpeting, ceiling tiles, etc. Hand Wipe Down w/ anti microbial solution. 4. Mold Damage Repair – Once all the affected building materials have been properly removed and disposed of, and the area has been clean, First Restoration Services can repair all damage back to its original condition. You can’t “kill” mold. The mold spores can only go dormant if it doesn’t have the right nutrients (food, water, warmth and oxygen) which basically means it won’t be releasing any mycotoxins. The best way to prevent mold from growing and releasing mycotoxins remove one of these four nutrients and keep all surfaces clean, dry and plenty of ventilation. Mold needs four things to grow. Food – organic materials such as paper, wood, plants, etc. Temperature – The optimal temperature for mold is between 60-80 degrees Fahrenheit. This also happens to be the optimal human comfort level for temperature. Oxygen – Mold need oxygen in order to thrive and grow. First Restoration Services follows the standard of care by the IICRC. The ANSI/IICRC S520 is a procedural standard for the remediation of mold damaged structures and contents. The ANSI/IICRC S520 is based on reliable remediation and restoration principles, research and practical experience, and attempts to combine essential academic principles with practical elements of water damage restoration for technicians facing “real-life” mold remediation challenges.